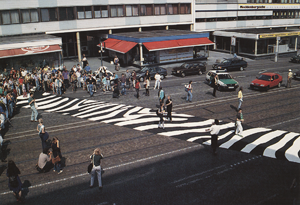 A time-lapse video of the world’s most famous zebra crossing (done for a band’s video), with some unusual, if predictable, pedestrian behavior. Driver compliance seems good (they must be used to it by now, and luckily the street is only two lanes), and I’m not sure if the guy at 1:34 is trying to generate Engwichtian “interest and intrigue” and calm traffic or what. Comments Off on Abbey Road Observational Traffic Study. Click here to leave a comment. Including, apparently, rush hour in Rosh Ha’ayin, Israel. Israeli drivers in Rosh Ha’ayin were met with an unusual sight Sunday evening, when a man dressed as Spiderman decided to use his superpowers to engage commuters sitting in evening traffic. Several drivers on the scene called the traffic police hotline to report the superhero’s unique participation in the traffic jam. The man leapt from vehicle to vehicle, occasionally attempting to lasso cars with an apparent ‘web’ made of ropes. Policewoman Ayala Cohen and police volunteer Uriel Dozriv arrived at the Rosh Ha’ayin junction, only to have their police car assaulted by a ‘spider web’. The two were able to subdue the man easily, upon getting out of the vehicle. When asked why he had dressed up as the comic super hero and endangered drivers, the man replied that he had been hit by a car and had found himself in the hospital wearing the costume. And you thought it was a radioactive spider. Comments Off on ‘Wherever There’s a Hang Up, You’ll Find the Spiderman’. Click here to leave a comment. Via Hard Drive, I was intrigued by the clever incentive Portland has undertaken to get more people commuting via bicycle: Free donuts and coffee to cyclists on the incoming bridges. Perhaps cocktails and peanuts for the ride home? Comments Off on Induced Demand. Click here to leave a comment. This from a press release titled: “ROAD USERS WARNED OVER INEXPERIENCED CYCLISTS.” Road users aren’t the same as cyclists, inexperienced or not? Read his full dissection here. The problems seem legion; for beginners, we don’t know that the cyclists hit are indeed the novel cyclists. These sorts of insurance-company led “studies” come up all the time in the media, and I’m not sure whether they’re done as PR stunts (I love that phrase “PR-reviewed scientific evidence”) for a willing media, or to scare us all into buying more insurance (or maybe getting us off the bike and into a car). There are real issues here, but head-line chasing does no one a service. Comments Off on Bad Cycling? Bad Science. Click here to leave a comment. The BBC reports that a driving instructor is suing for damages over a driving test. Mr Carmichael said he recorded 14 faults with the driving of the woman taking the exam, claiming five were serious and one dangerous. He’s suing the insurer of the exam car, not the would-be student (who, uh, failed). Ms Tait asked Mr Carmichael, a former driving instructor, if he was seriously telling the court that this incident, if it occurred as he said, was the worst he had experienced in over 12 years of having learner drivers at the wheel. Comments Off on And You Thought Driving Tests Were Stressful for the Students. Click here to leave a comment. Interesting road-trip with 2008 hyper-miling champion Jack Martin, particularly for his comments about trucks and bikes. Comments Off on Jack Martin on Hypermiling. Click here to leave a comment. 9/11 and the Subsequent Rise in Traffic Fatalities: More Exposure, or More Stress? There have been a number of papers that have argued that have identified a post 9/11 uptick in traffic fatalities, theoretically based on a rise in driving, itself motivated by a fear/dread of flying (most notably, Gerd Gigerenzer, 2004, “Dread risk, September 11, and fatal traffic accidents,” in Psychological Science). A new paper, “Driving Under the Influence (of Stress): Evidence of a Regional Increase in Impaired Driving and Traffic Fatalities After the September 11 Terrorist Attacks,” by Alexander J. Rothman, et al., also in Psychological Science, comes to a rather different conclusion. Lastly, one can’t be certain that aggressive driving or impaired driving is a sign of “psychological distress.” Still, the pattern, localized in time and place, seems very real and suggestive. Comments Off on 9/11 and the Subsequent Rise in Traffic Fatalities: More Exposure, or More Stress?. Click here to leave a comment. If you’ve ever wanted to know what Harper’s Index has to say about traffic, look no further (the number refers to the date of publication, and the source is listed below each item). Comments Off on Traffic in Numbers. Click here to leave a comment. 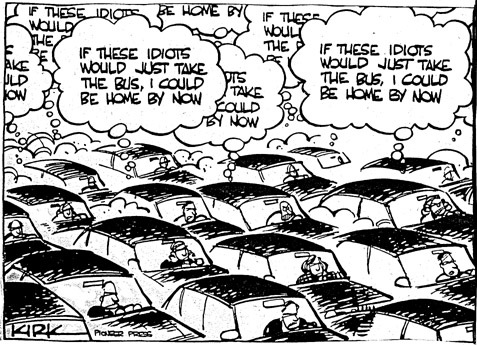 Are Traffic Problems Population Problems? I was reminded of this in a recent flurry of articles about overpopulation (here, for example), something that was broached again with the sordidly surreal “octuplets” case. 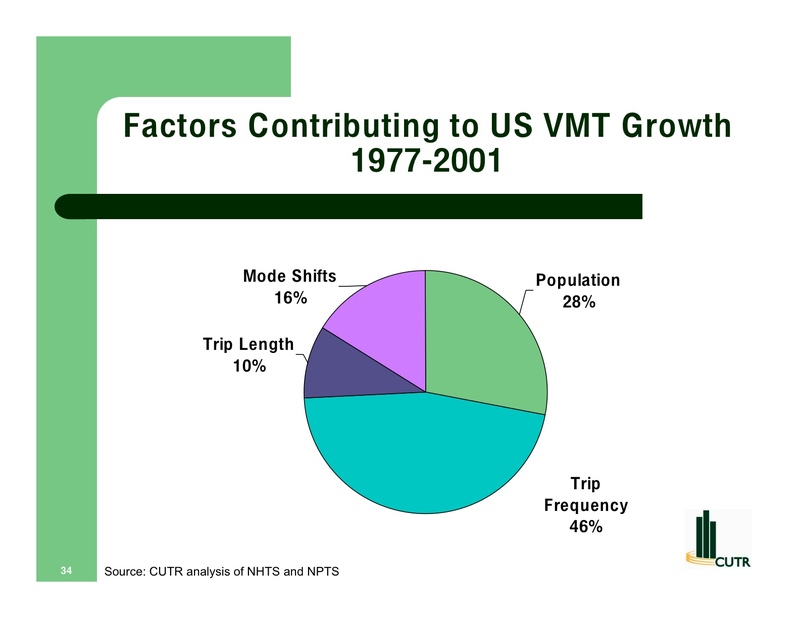 Given that we’ve added roughly 100 million people since 1968, one does have to wonder, however, about the link between a growing population (via births or immigration) and consistently rising travel times (NB: traffic is far down on my list of “things to be worried about by a growing population”). But looking at some research by Steven Polzin, at the University of South Florida, this relationship is not as simple as it might seem. 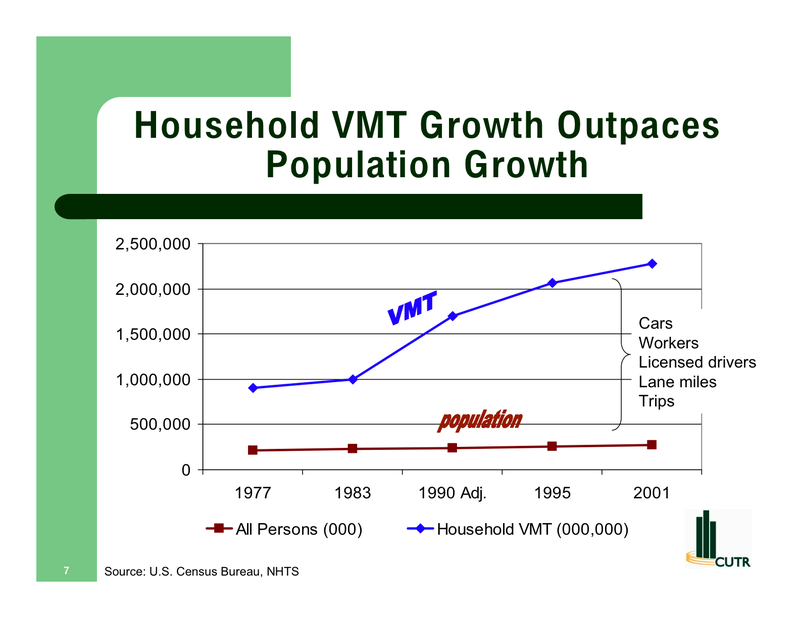 The first thing to note, as in the slide below, is that while population has been on the rise, it is far outpaced by “vehicle miles traveled.” It’s not just how many people we have, it’s how much they’re driving. 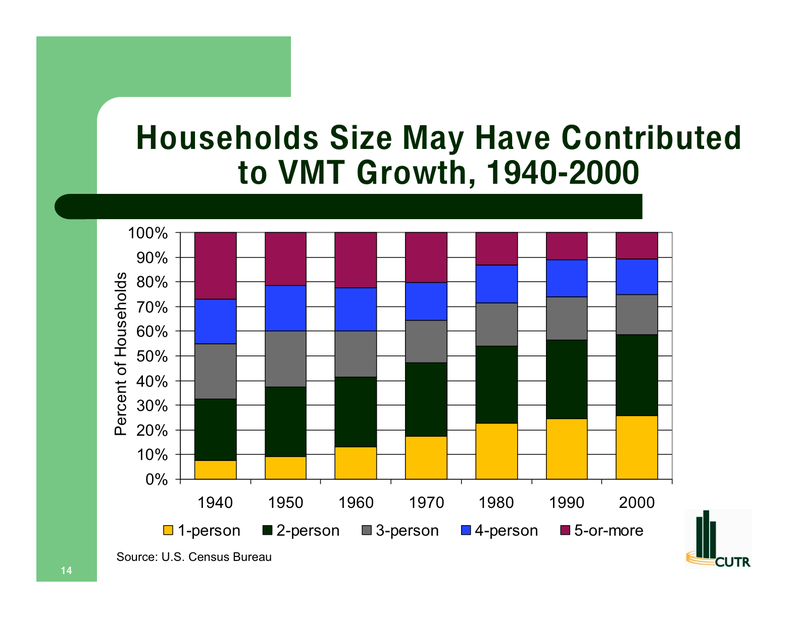 And while it is inherently true that larger families consume more resources, including miles traveled, there is something of an “economy of travel” as household size increases. Most interesting, though, for travel demographers is the increasing number of single-person households, as in the slide below. 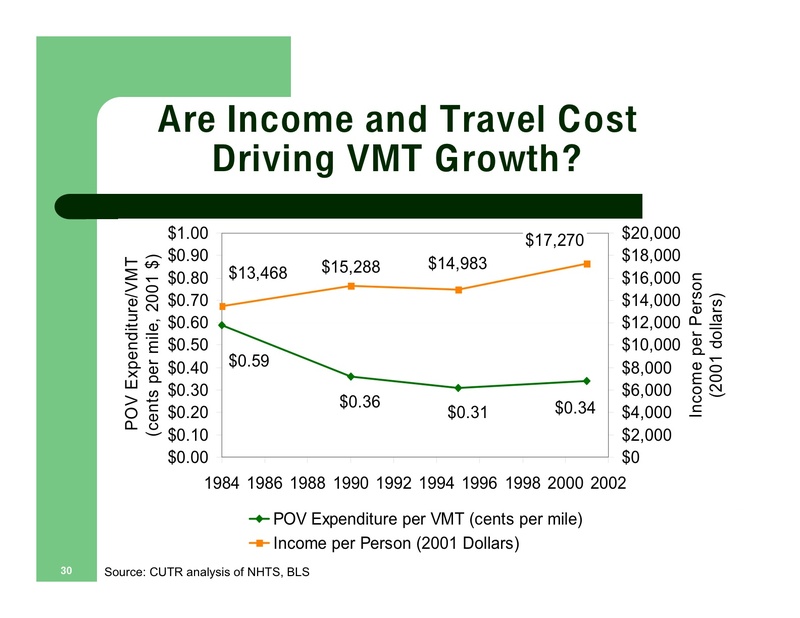 Also of interest is the issue of rising income, and the decreasing cost of travel. 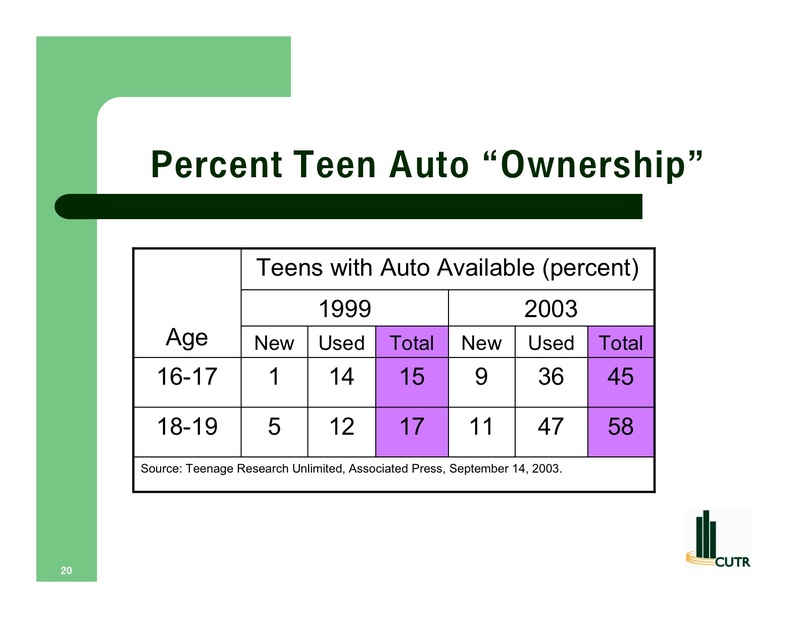 And there’s the people who didn’t have cars who increasingly seem to have one. It goes without saying that population plays some role in contributing to congestion. But what is arguably more critical is a number of demographic changes in the population itself, including the way it has chosen to live (non-walkable neighborhoods in far-flung suburbs, meaning more trips and longer trips — a trend that Richard Florida suggests may have reached its zenith in the current economic meltdown), declining walk-to-work and walk-to-school shares, increasing numbers of cars per household, higher shares of licensed teenage drivers, declining carpool participation rates, under-priced car travel, declining transit funding, etc. etc. For an example of how things can be done differently, we can look no further than NYC, where a recent study found that between 2003 and 2007, even as the city continued to grow (economically and population-wise), vehicle traffic actually dropped. Granted, the subway cars have felt more crowded since the introduction of the Metrocard, but unlike vehicular traffic, an absolutely packed train travels at essentially the same speed as an empty one. Comments Off on Are Traffic Problems Population Problems?. Click here to leave a comment. Just for dark humor — it’s Friday, after all (and appropriately, it’s Friday the 13th). Comments Off on Human Factors. Click here to leave a comment. 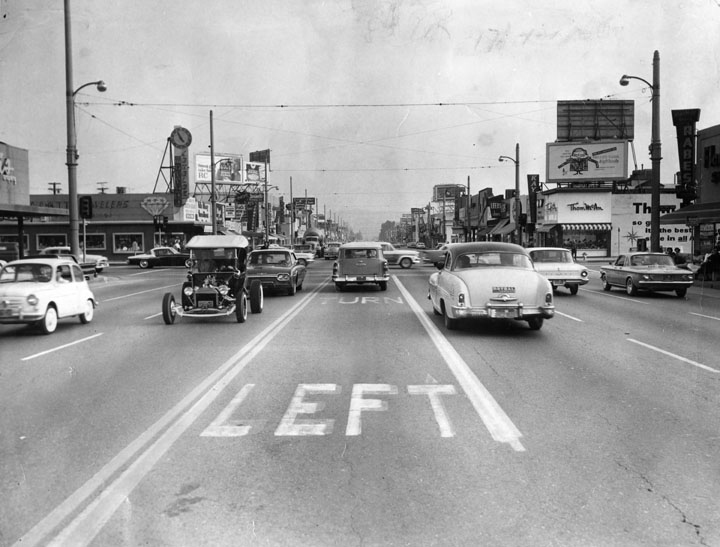 Why does traffic behave differently in different places? Why does driving in Cairo set the nerves on edge, while in Munich people stoically wait for crossing signals, even at minor intersections? One’s first impulse may be to reach for cultural explanations. In Chinese cities, where queuing can seem rampantly disorderly (something the government endeavored to correct ahead of the Olympics), perhaps it’s only natural that negotiating an intersection can seem so trying. Go to Denmark, with its famously self-effacing and polite residents, and the highways are largely marked by scrupulous lane discipline and a lack of horn honking. Or maybe it’s urban density, and the vehicle mix. Delhi is more crowded than New York or London, packing some 48 different modes of transport onto its streets. In sprawling Los Angeles, there is essentially one mode — the car — and plenty of wide (if congested) streets to drive on. How could the former not seem more “chaotic,” at least to the uninitiated? Perhaps economics has an answer. The American economist George McDowell, using as an opener John F.A. Taylor’s comment that the “market is… a traffic in claims, not in things” — i.e., it’s not only commodities per se but relationships between people and things — goes on to postulate a theory that a country’s traffic behavior has something to do with its market structure. China, McDowell argues, has historically had a mixed economic structure — some state-owned enterprises, but also a “long entrepreneurial tradition.” In the latter system the advertised price on a product is often just a suggestion; the real price is whatever is agreed upon. If you pay too much, the “advantage” goes to the shopkeeper. And so it is with Chinese traffic: Turning, merging, yielding and the like are opportunities to be gained or lost. If one is cut off, one accepts that they have been bested in this one-time transaction. As a rough rule of thumb, then, one might say if you’re driving in a place where bargaining over transactions is expected, there will be a good deal of bargaining on the road. If you’re in a place where the set price is always paid, you might expect traffic behavior to also follow these implicit top-down rules. 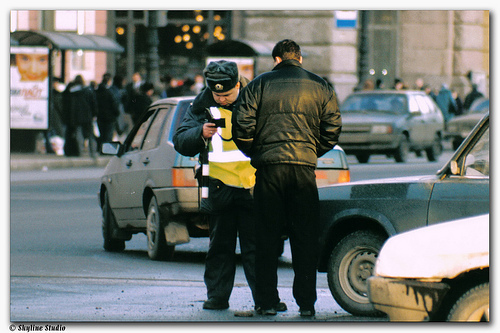 Comments Off on Traffic Culture and Corruption: A Few More Thoughts. Click here to leave a comment. A few months ago, I was pretty intensively playing Grand Theft Auto IV. As an urbanist, I was curious about its immersive, complex representation of the city — or maybe I just wanted to blow things up after a long day’s work. Naturally I took an interest in the traffic life of “Liberty City,” which, like the New York that is its inspiration, is a multi-modal mix of pedestrians, cars, subways, motorcyclists, taxis — though, curiously, no cyclists (I thought it might be a programming issue, but there are motorcycles). 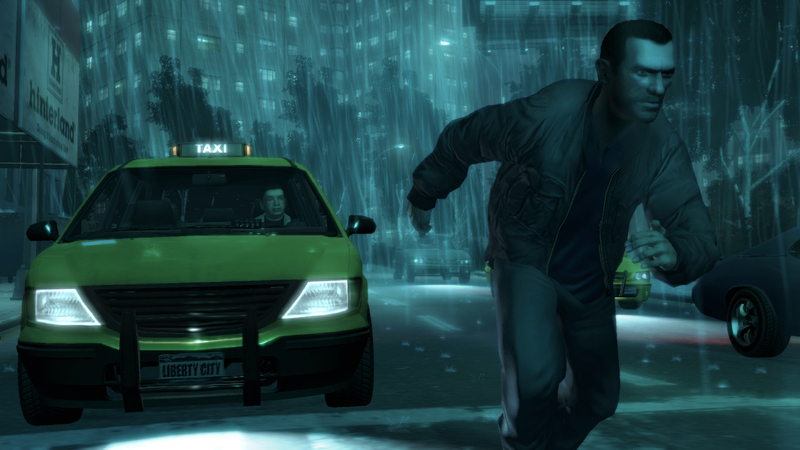 Its protagonist, the amoral Niko Bellic, presumably not in the country legally, is also presumably an unlicensed driver (that’s the least of his legal violations, of course). At first, I drove quite cautiously, as I thought the omnipresent police might nab me for violating red lights, or even speeding. I soon learned, however, that traffic infractions were not part of the Liberty City PD’s bailiwick — even though, of course, a routine traffic stop might have netted them a gangster. In fact, you pretty much had to commit full-scale mass pedestrian vehicle homicide to even attract the attention of the police. For Niko the driver, Liberty City was pretty much a place where he was at liberty to disregard any rule of the road. Hmmm… a city where one can routinely drive at high speeds, even in crowded urban environments, with little repercussion, where even striking a pedestrian will get you little more than a few pointed questions from the police (and in fact it may have even been the police that did it), where traffic signals are treated as optional… This is where the line between Liberty City and New York City really does get blurry. A new report from Transportation Alternatives confirms what New York pedestrians and cyclists have been forced to accept as a fact of life: A high number of drivers speed through city streets, regardless of the potentially deadly consequences for those around them. “Terminal Velocity: NYC’s Speeding Epidemic” shows that 39 percent of observed motorists were driving in excess of the 30 mph speed limit. Using radar guns and speed enforcement cameras at 13 locations, TA volunteers clocked speeds in excess of 60 mph in school zones and other areas with heavy pedestrian traffic. Most speeding drivers were traveling between 31 and 40 mph. While a pedestrian struck at 30 mph has a 60 percent chance of surviving a collision, the likelihood of survival drops to 30 percent when the vehicle is moving at 40 mph, TA notes. The name Liberty City was well chosen by GTA’s creators as its NYC stand-in, at least in the case of many Gotham drivers: You are at liberty to ignore laws. Of course, as John Stuart Mill wrote in On Liberty, “the only purpose for which power can be rightfully exercised over any member of a civilised community” is “to prevent harm to others.” There’s plenty of harm, let’s get exercised. Comments Off on Liberty City. Click here to leave a comment. 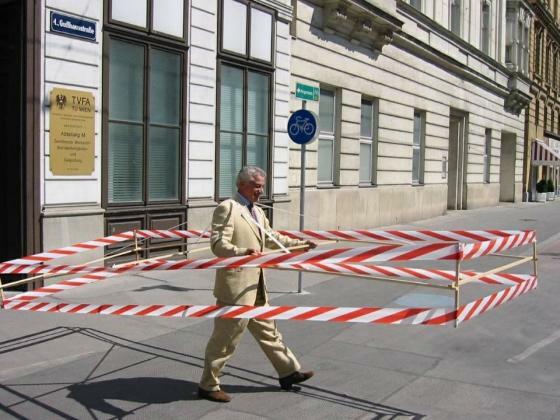 Removing Lines as a Traffic Calming Measure: Data, anyone? 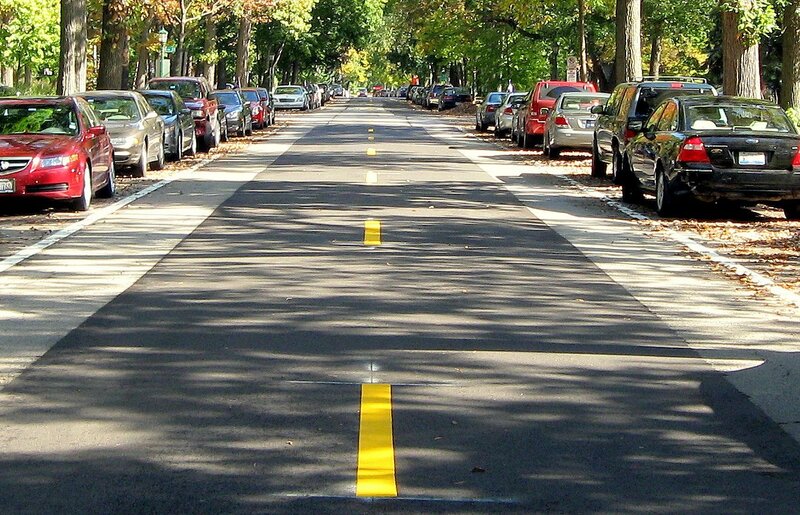 Reader Bob Widlansky, from Wilmette, Illinois, writes in regarding a problem on his street that is perhaps the most universal complaint in the world of traffic: Drivers going too fast on residential streets. He has begun pushing the idea (rather unsuccessfully — the city engineer cites safety concerns) at local meetings to remove the center lines, a concept that I describe in Traffic, based on some research done by the TRL and demonstrated in some rural English towns — where it was found that removing the center-lines not only reduced speeds, it led drivers to put more distance between themselves and the opposing stream of traffic. The theory is that lines reduce vigilance, reduce thinking, and potentially increase speeds. I thought I’d open this to the audience: Can anyone help out Bob with studies (before/after observational would be best here, I’d imagine), or have you successfully had lines removed? Or is this even the right way to go about this? 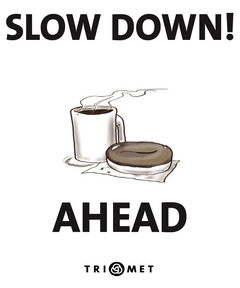 Do you have any other suggestions for calming Greenleaf Avenue? Judging by the photo, there are already parked cars, and interestingly, there’s already a sort of differential pavement treatment, a bit confusing to my eyes but apparently not to speeding drivers. What else can be done? Comments Off on Removing Lines as a Traffic Calming Measure: Data, anyone?. Click here to leave a comment. 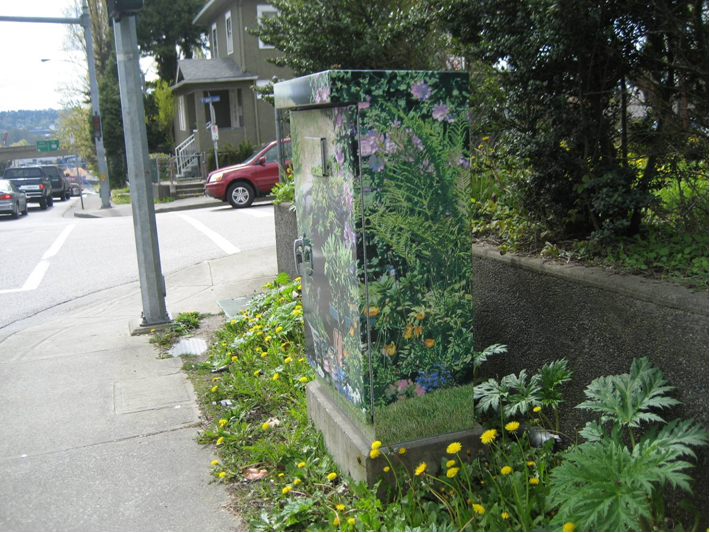 I recently mentioned artist Robbie Conal’s discovery a while back that traffic light signal boxes made the perfect venue for his art in Los Angeles. Via Mike on Traffic, I was intrigued by a public art program in the Texas town of North Richland Hills that turns these overlooked bits of traffic infrastructure into an officially sanctioned canvas (evidently it was also done to preempt graffiti). 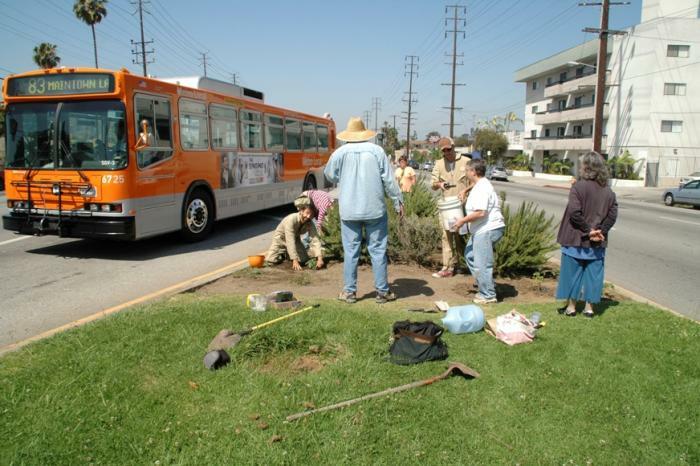 The video below, produced by the city’s Art in Public Spaces program, shows some more iterations. I’m all for public art, though I do admit the concept of cars sitting at an intersection being “public space,” while technically true and a fact of life in most of the U.S. (and already realized by people like Conal), still strikes me as a bit odd (particularly since drivers in cars exist in a strange netherworld of coexisting private spaces) — although admittedly the picture above looks like a pretty walkable sort of environment. And how many yellow boxes can you have, anyway? Comments Off on Signal Art. Click here to leave a comment. Dangerous Roads, or Dangerous Driving? This piece from Fox News (after the jump as well) claims to identify the “top 10 most dangerous roads in America,” implying as well that stimulus spending might somehow be directed to these corridors of death. But reading through the piece, the overwhelming impression left with me is not design or infrastructural shortcomings, but driver shortcomings: Speed, alcohol, fatigue. 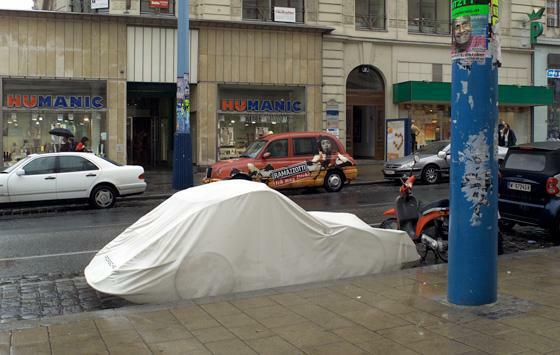 Comments Off on Dangerous Roads, or Dangerous Driving?. Click here to leave a comment.